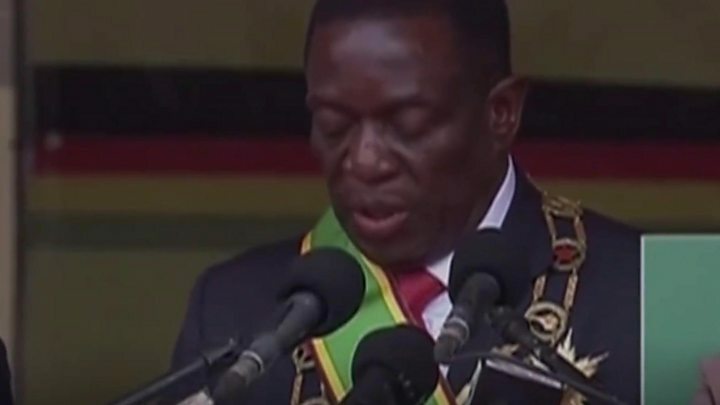 Media captionPresident Mnangagwa called Robert Mugabe "a father, mentor, comrade-in-arms and my leader"
Zimbabwe's new President Emmerson Mnangagwa has addressed a packed stadium, vowing to serve all citizens. He said he felt "deeply humbled" to take the role. And he said he was "not oblivious to the many Zimbabweans from across the political and racial divide who have helped make this day." He paid tribute to his predecessor Robert Mugabe - to muted applause - calling him "a father, mentor, comrade-in-arms and my leader". Mr Mugabe left office dramatically this week after 37 years of authoritarian rule. His departure followed a power struggle in which Mr Mnangagwa was sacked as vice president to pave the way for Grace Mugabe, the then-first lady, to take up the presidency. Mr Mnangagwa fled the country but returned to a hero's welcome and on Friday struck a conciliatory tone. "The task at hand is that of rebuilding our country," he said. Although Mr Mnangagwa has unseated Zimbabwe's long-time ruler, he is still associated by many with some of the worst atrocities committed under the ruling Zanu-PF party since the country gained independence in 1980. He was the country's spymaster during the 1980s civil conflict, in which thousands of civilians were killed. But he has denied any role in the massacres, blaming the army. How did the inauguration unfold? Tens of thousands of people packed the National Sports Stadium in Zimbabwe's capital, Harare, to witness the inauguration. Pop singer Jah Prayzer provided the entertainment and, as people in the crowd danced, the atmosphere was closer to that of a concert. Dignitaries, including leaders from various African countries, filed in to cheers. Opposition leaders Morgan Tsvangirai and Joice Mujuru - who both had their sights on the presidency at various times - were there. Will Mnangagwa be different from Mugabe? Mr Mnangagwa was led in the oath of office by Chief Justice Luke Malaba, saying he would "be faithful to Zimbabwe", "protect and promote the rights and people of Zimbabwe" and discharge his duties to the best of his abilities. Mr Mnangagwa was accompanied by his wife Auxilia and gave her a kiss after the green presidential sash was placed around his neck. No - and the official reason given was that at 93, the former president needed to rest. But the fact he is not attending is a reminder that this is no ordinary transition, the BBC's Andrew Harding reports, and that despite Mr Mugabe's official resignation he was forced out by the military. On Thursday, several reports suggested Mr Mugabe had been granted immunity from prosecution. Local media are reporting that Mr Mnangagwa has offered the Mugabe family "maximum security and welfare". The former president "expressed his good wishes and support for the incoming president," the Herald newspaper reports. How did Zimbabwe get to this point? The news on Tuesday that Mr Mugabe was stepping down sparked wild celebrations. It came in the form of a letter read out in parliament, abruptly halting impeachment proceedings against him. He had been under pressure since the military took control of the country a week before, seizing the headquarters of the national broadcaster. Although Mr Mugabe was largely under house arrest for several days, he appeared to be resisting pressure to stand down. On Saturday, tens of thousands of Zimbabweans took to the streets of Harare to urge him to go. The demonstration was led by veterans of the country's war of independence, who last year turned against him. On Sunday, Zanu-PF sacked Mr Mugabe as its leader. Two days later, he resigned as president. In his letter, he said he was resigning to allow a smooth and peaceful transfer of power, and that his decision was voluntary. Will the change be good for the economy? Zimbabwe's economy is in a very bad state. It has not recovered fully from crises in the last decade, when rampant inflation grew so bad the country had to abandon its own currency. Now, according to some estimates, 90% of people there are unemployed. Its main industrial index has slumped by 40% since last week's military intervention and the stock market has shed $6bn (£4.5bn) in a week. Analysts say the market is now correcting itself, optimistic of a change of economic policy under Mr Mnangagwa. However, the International Monetary Fund has warned that Zimbabwe must act quickly to dig its economy out of a hole and access international financial aid. In his speech, Mr Mnangagwa said he would base a new economic policy on agriculture and foreign direct investment. He has pledged to create jobs. He also said the country's land reform programme would not be reversed, but pledged to compensate farmers for the land that was confiscated from them. The seizure of land from white farmers is seen as a key factor in the country's economic meltdown. On Thursday, Zimbabwe's main opposition MDC party called for deep-rooted political reform to dismantle the repressive apparatus that sustained Mr Mugabe's regime. 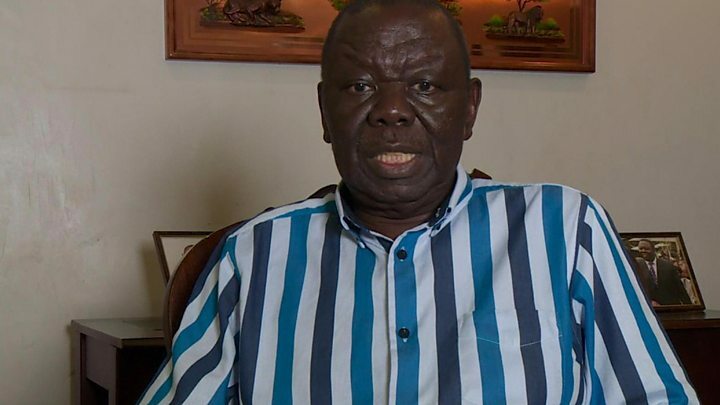 Media captionLeader of the opposition MDC party, Morgan Tsvangirai, warns of a "power retention agenda"
MDC leader Morgan Tsvangirai said the "culture of violence" and "culture of corruption" had to be changed after "after so many years of Zanu-PF misrule". 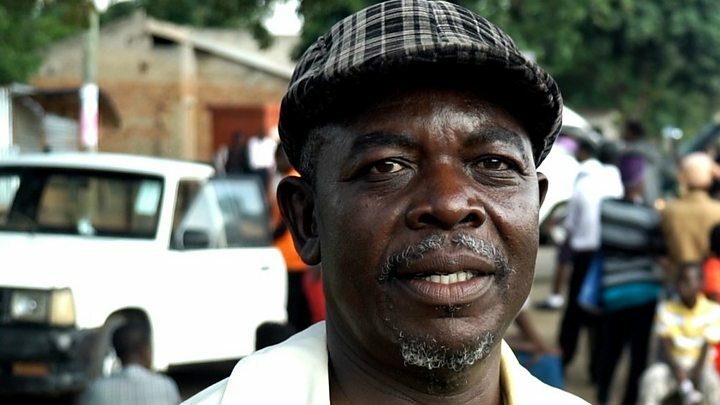 It is unclear whether Zanu-PF will govern alone ahead of scheduled elections next year, or whether a coalition government of national unity that includes opposition groups will be formed. Mr Mnangagwa confirmed in his speech that elections would be held as planned. Zimbabwe after Mugabe: What happens next?